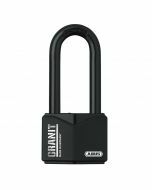 Granit padlock ABUS 37/55 the padlock for highest security requirements. The 37/55 Granit is best used to secure halls, doors, gates, containers, trucks etc. Due to the Black Granit anti-corrosion coating, the lock is well suited for outdoor applications. 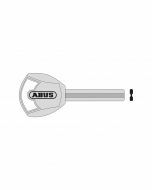 The ABUS-Plus disc cylinder makes the lock very hard to pick. The 37/55 is manufactured in accordance with high European standards and reaches a CEN Class 4 certification. The Granit series is completely made in Germany. For comfortable use in the darkness, one of the two included keys is equipped with an LED light. Granit locks are available either with a code card for easy key reproduction or with a security card for full control over the amount of spare keys in circulation.